During the EAC Board Meeting on May 15 and 16, 2016, a special gift was presented to outgoing President, Beryl Burnett. 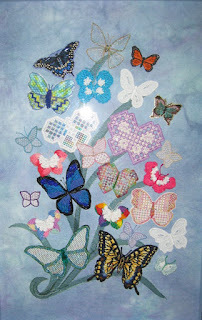 Organized by outgoing Past President, Joyce Gill, board members stitched butterflies and sent them to Joyce to be assembled and framed. The result was a thoughtful and heartfelt thank you to Beryl for her leadership of the Board during her term as president. Stitched in a wide variety of techniques and with a range of fibres, this work of colourful butterflies will be a treasured keepsake of Beryl's time as EAC President.